"Most ankle sprains result from damage due to an acute twisting of the foot or are caused from landing from jumps, stepping on another athlete's foot, trauma at heel strike during running or stressing the foot while in a fixed position," according to lead author Thomas W. Kaminski, PhD, ATC, University of Delaware, Athletic Training Education Program. "The guidelines we've recommended provide sports medicine professionals, coaches, parents and others with appropriate steps to provide the best possible care." Sports with the highest incidence of ankle injuries are field hockey, followed by volleyball, football, basketball, cheerleading, ice hockey, lacrosse, soccer, rugby, track and field, gymnastics and softball. Ascertain the patient's history, including the cause of injury and past injuries. A previous ankle sprain is the most common risk factor for recurrent ankle sprain. This can provide important insights, though severity of injury may be difficult to determine. Assess active, passive and resistant range of motion (ROM) about the ankle. This can provide insight into injury to ligaments, muscles, tendons and nerves. Administer special testing to assess injury to the lateral ankle ligaments performed soon after injury and before joint swelling. This may have better diagnostic accuracy than tests performed after swelling has occurred. Use magnetic resonance imaging (MRI) as a reliable technique to detect acute tears of the ligament after injury. Compared with MRIs, diagnostic ultrasound is useful but less accurate in detecting acute ankle injury. an increased risk for ankle osteoarthritis. Cryotherapy (e.g. 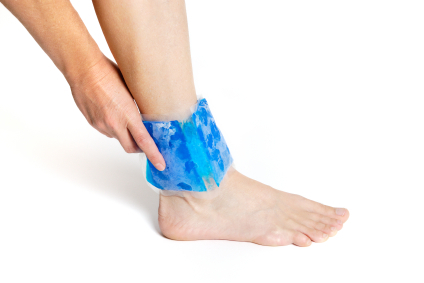 ice packs, water immersion, application of frozen cups of ice, chemical cold packs, cold sprays) should be applied to acute ankle sprains to reduce pain, minimize swelling formation and decrease secondary injury, although the optimal mode, duration, and frequency of reapplication have not been established. Caution should be used when applying chemical cold packs because the below-freezing temperature and direct exposure to the skin can cause tissue damage. Heat treatment (thermotherapy) is not recommended as an injury treatment, mostly due to the lack of quality research needed to make a clinical recommendation either for or against the practice. Compression should be applied to acute ankle sprains to minimize swelling and is applied in a variety of modes, including elastic wraps (e.g "Ace" bandages), adhesive tape, commercial braces, and units that apply simultaneous cold and compression. As with cryotherapy, there is limited evidence from high-quality clinical trials to support the use of compression, and there is minimal research on the advantages and disadvantages of one mode of compression over another. The limb with the acute ankle sprain should be elevated to minimize swelling. The limb with the acute ankle sprain should be elevated (e.g. Nonsteroidal anti-inflammatory drugs (NSAIDS), administered orally or topically in the form of creams, gels, and sprays, reduce pain and swelling and improve short-term function after ankle sprains. The major advantages to topical NSAIDS are their effectiveness in reducing pain without systemic side effects. Functional rehabilitation with ankle stabilization (via elastic bandage, bracing, taping, or external support, or a combination of these) with progressive weight bearing and exercise, is more effective than immobilization in managing grade I (mild) and II (moderate) ankle sprains. Grade III (severe) sprains should be immobilized for at least 10 days with a brace or below the knee cast and controlled therapeutic exercise. Rehabilitation should include comprehensive range of motion, flexibility and strength training, and balance training. Before the patient returns to sport-specific tasks, the injured limb's functional performance should measure at least 80 percent of the uninjured limb. Athletes with a history of previous ankle sprains should wear prophylactic ankle supports in the form of taping or bracing for all practices and games. Both lace-up and semi-rigid ankle braces and traditional taping are effective in reducing the rate of recurrent ankle sprains in athletes. Clinicians working with athletes should implement a multi-intervention injury prevention program, lasting at least three months that focuses on balance and neuromuscular control to reduce the risk of injury. Addressing the strength of the leg muscles, hip extensors and abductors may be an ankle injury-prevention strategy. Clinicians should consider assessing dorsiflexion (upward movement of the foot at the ankle joint) ROM in at-risk athletes. If the ROM is limited, clinicians should incorporate techniques to enhance motion for possible prevention of ankle injury. Syndesmotic or high ankle sprains are characterized by symptoms including prolonged pain, bone spurs and functional disability. Evaluation should include testing, functional evaluation and radiography, with MRI if indicated. High ankle sprains should be treated more conservatively than lateral sprains. Acute management includes immobilization for a period of time to allow healing and functional return. Surgery should be considered for high ankle sprains that demonstrate more joint incongruity and instability. Clinicians should be aware of any characteristics that define chronic ankle instability. Strategies that focus on balance, strength and dynamic movements with changes in direction may be effective in reducing risk of recurrence. "Individuals who suffer ankle sprains typically have high occurrence rates, prolonged symptoms, diminished quality of life, reduced physical activity levels and a propensity to develop chronic ankle instability and an increased risk for ankle osteoarthritis," adds Kaminski. "Managing these injuries can be challenging, and following the proper protocols is critical for a successful and sustained return to activity." For a copy of the complete statement, visit http://www.nata.org/sites/default/files/ankle-sprains.pdf.